Graig – seems like he’s with them ….I dunno my mind is racing. Kevin – So Sarah wanted to talk as a group? They both agree the vote is going to be unanimous for Sindy to leave. Johnny says if he had won the POV he would have wanted to use it but it would have put a huge target on their backs everyone would think there was a guys alliance. 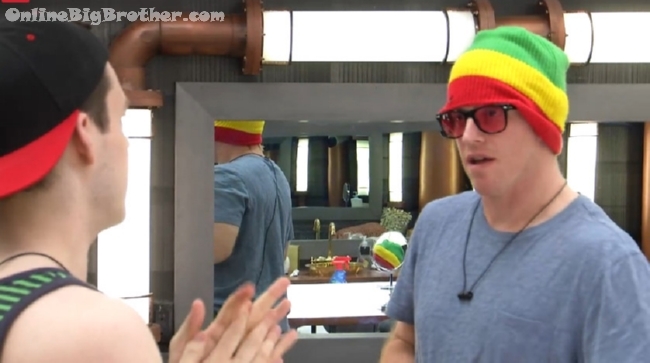 Kevin appreciates that Johnny gave it all he had during the POV. 7:07pm backyard giggling about Kevin making out with Pilar. Graig jokes next time they want a nap they need to flood the HOH. They start talking about the feed. Jordan and Willow being feed watchers says the two big differences about US and Canada feeds are 1) Canada feeds are free 2) Canadian houseguests are kept up where US are allowed to sleep during the day. Willow also points out that the US house guests spend a lot of time sun tanning. Graig – we have to get this. Graig Telling him that the core 4 (Bobby, Graig, Zach and Kevin) have to stay strong. Graig adds that he loves Bruno he’s hanging out with him. Graig stresses to stay strong and get out Naeha. Omg! There he is. I thought something had happened to Godfrey. I haven’t seen him in 24 hours. What has the man been doing all this time, while the other contestants have been busy playing BB? Don’t want Sindy to go!! She’s a comp beast- she has potential to really shake up the house. do you guys mind posting the current alliances at the end of each post, and which ones are real or not? Sure will I’m still trying to figure it out myself. way too much. when HGs are too intense talking game to everyone or anyone, they alarm others, including or especially those who they align with.